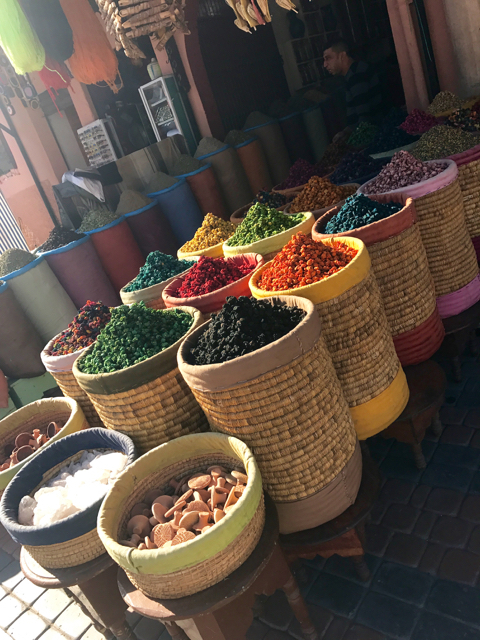 I had one of the best holidays earlier this year in Marrakesh, Morocco, a most inspiring, creative & magical place especially for a food blogger. I stayed at the Riad Les Trois Mages (The Three Kings) in the Medina, or old city. 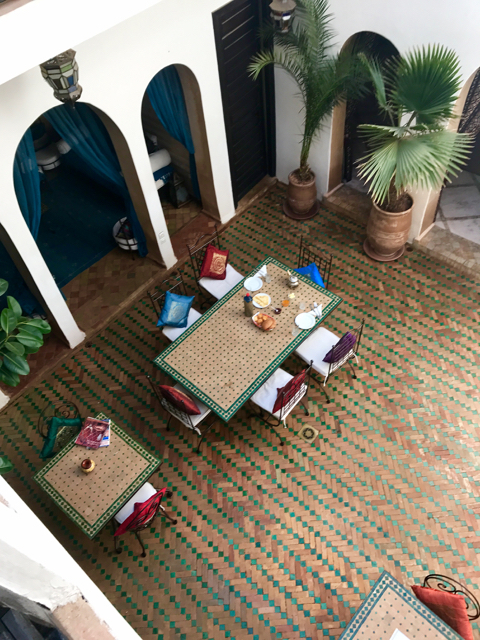 The historic house, has been beautifully restored by owners Anna & Tony, and run as a boutique Riad. 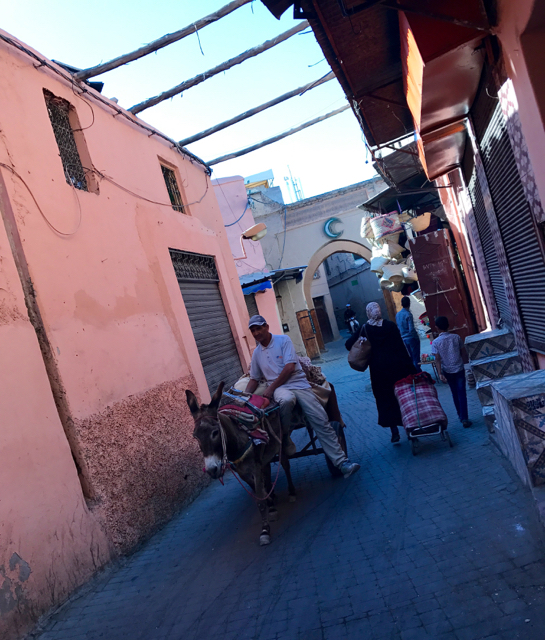 We arrived by taxi, our driver expertly negotiating the ever narrowing streets & hustle bustle typical of morning life in the Medina. 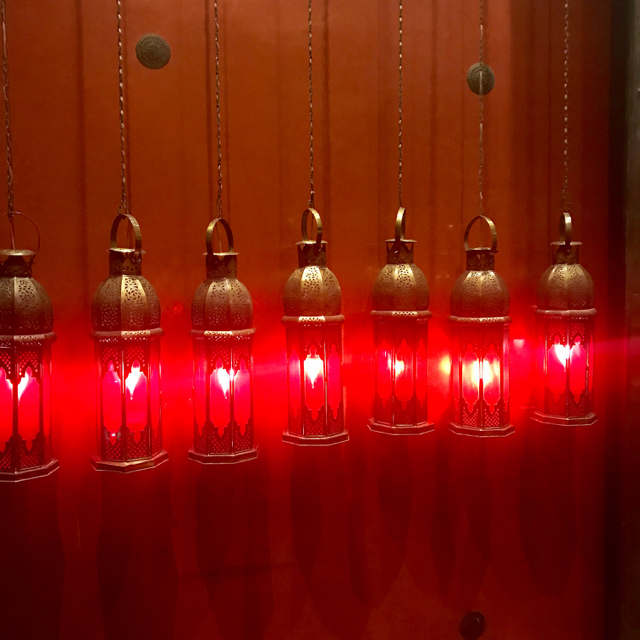 A heavy dark wooden door with cast iron studs, hinges, door knocker and the biggest lock suddenly opened and we were greeted with a welcoming broad smile by Aziz, the General Manager. Marian, an old friend has stayed there many times and we were immediately ushered through to the courtyard for a catch up on all the family & local news. It was an oasis of calm and tranquility away from the vibrant atmosphere of the Medina. Saida the resident chef, prepared a delicious breakfast of freshly baked croissants, pancakes, fruit, jam and the first of many glasses of Moroccan mint tea, served in an antique silver teapot and expertly poured from a great height in a thin stream, with the minty aromas filling the air . The friendly Moroccan hospitality from Aziz, Saida, Mouhsin, and the rest of the team really made our stay incredibly special. Anything we needed from restaurant bookings, taxis, suggestions on places to visit to my personal guide of the souks was efficiently arranged, always with a friendly smile! 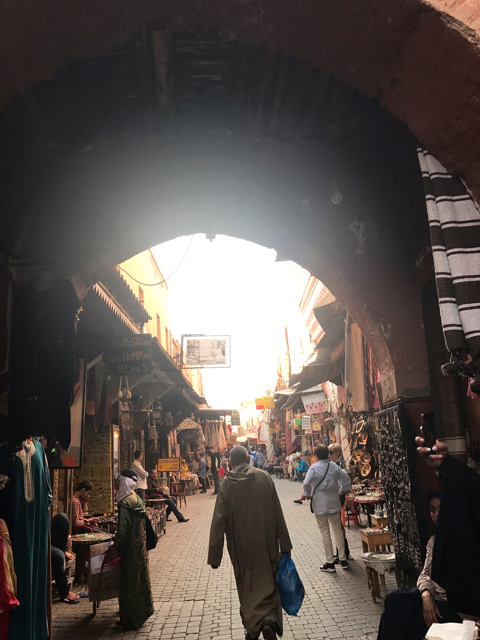 Marrakesh is a great place to meander, taking in the atmosphere and marvelling at all the artisans, who make and sell their wares. In the souks, expect a greeting from some of the shopkeepers, enticing you to look & hopefully buy. I did not feel it was intrusive, and was happy to partake in some friendly banter! The narrow streets are busy, from the mopeds zipping past, to the locals, with their shopping trollies of goods, and carts pulled by hand or donkey. It is a cacophony of sights, sounds, smells & tastes, and the atmosphere & creative buzz is infectious. 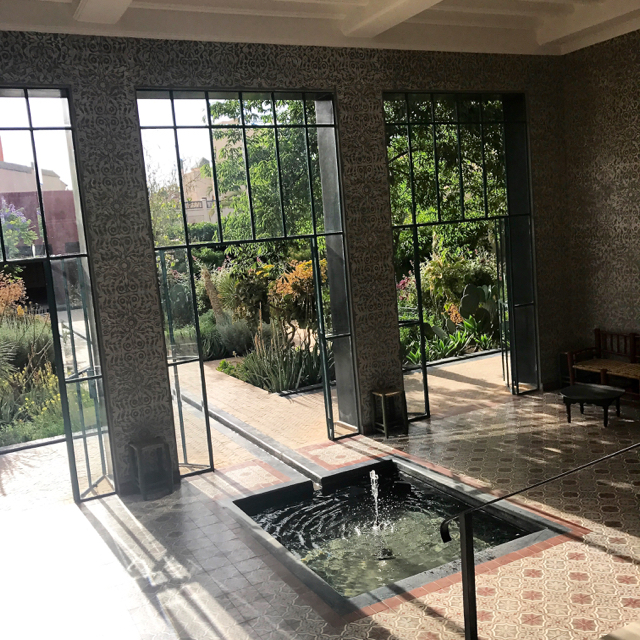 By contrast there were many places to relax whether the Riad’s roof terrace & a quick dip in the small pool, in a local cafe or the gardens, hidden behind the ancient stone walls of the Red City. 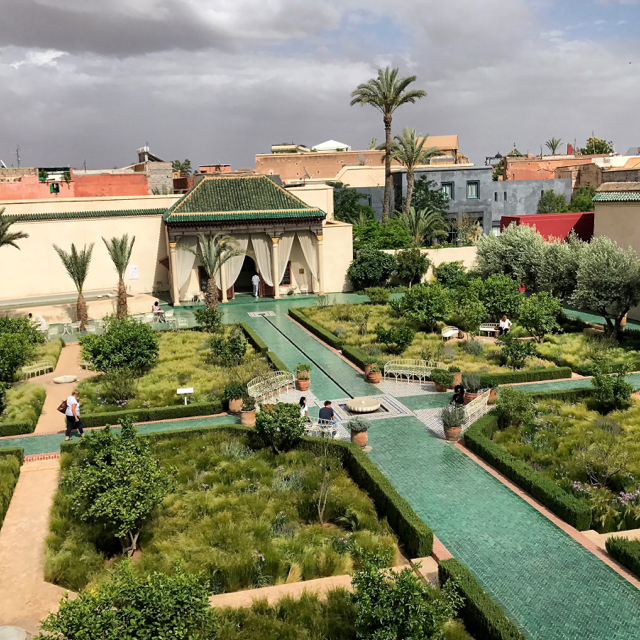 Aziz recommended Le Jardin Secret (Secret Garden), a mid 19th Century palace with both exotic & traditional Islamic botanical gardens. It opened last year after restoration by an award winning British garden designer, a team of Italian architects and expert local builders. I had a tour of the tower, from Jawad, the guide, who recounted its history, from the 16th Century when the Saadian Sultan built the original palace, whilst we climbed the steps up to a roof terrace and fantastic view of the city. 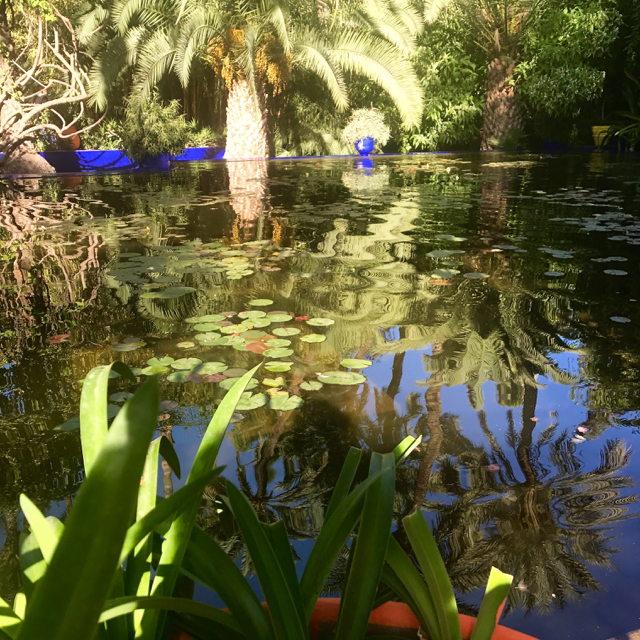 I also visited the more well known botanical gardens – Jardin Majorelle, arriving early on Saturday morning, to miss the crowds. 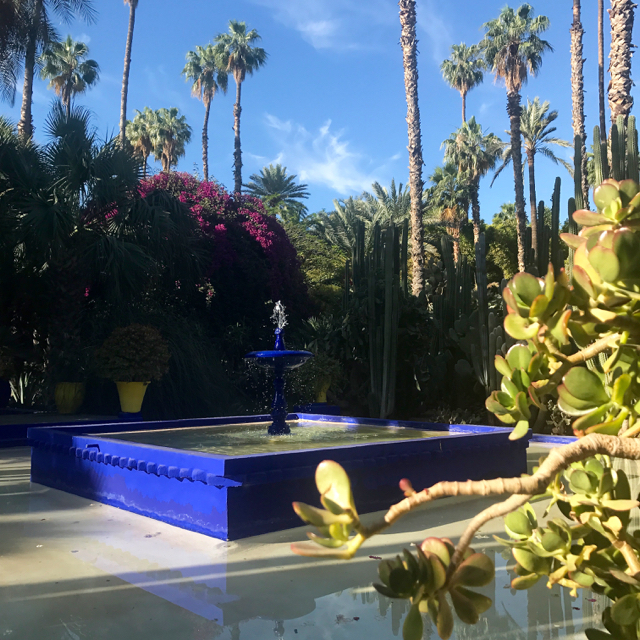 Originally the family home, artist studio & gardens of French artist Jacques Majorelle in 1930’s, it was discovered overgrown and in need of TLC by the fashion designer Yves Saint Laurent. Together with Pierre Bergé they bought & lovingly restored the buildings and gardens. 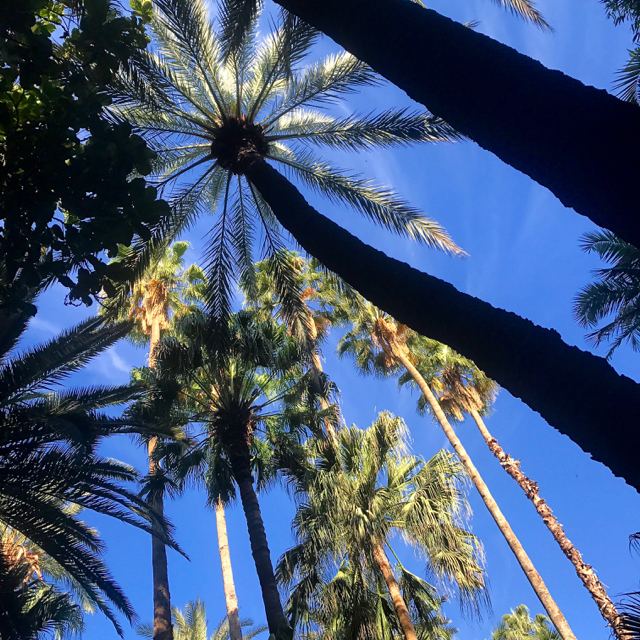 I walked around looking through the palm trees up to the vibrant blue sky that matched the famous “Majorelle blue’ painted villa & fountains. I sat listening to the birdsong and the gentle lapping sounds of the water – a place of calm serenity and quiet reflection – magical! So what about the food? 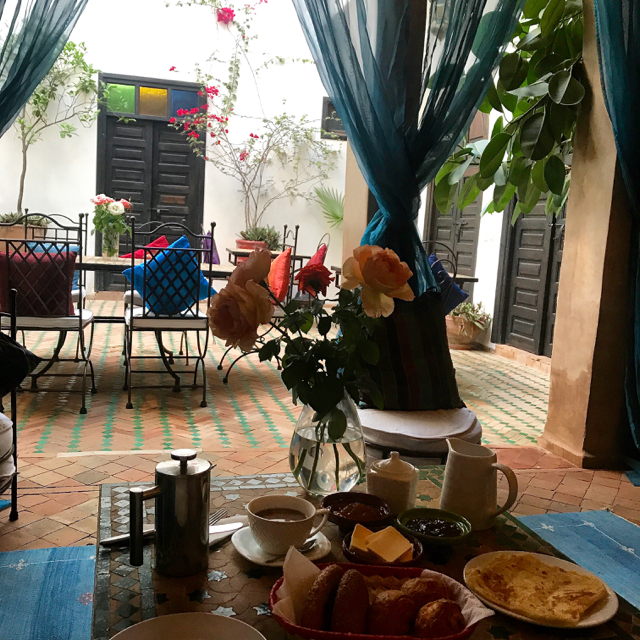 Marrakesh is a must for foodies and the cuisine has many influences including Arabic, Berber, North African, Jewish, & Mediterranean – especially French & Spanish ( from Andalusia in the South). 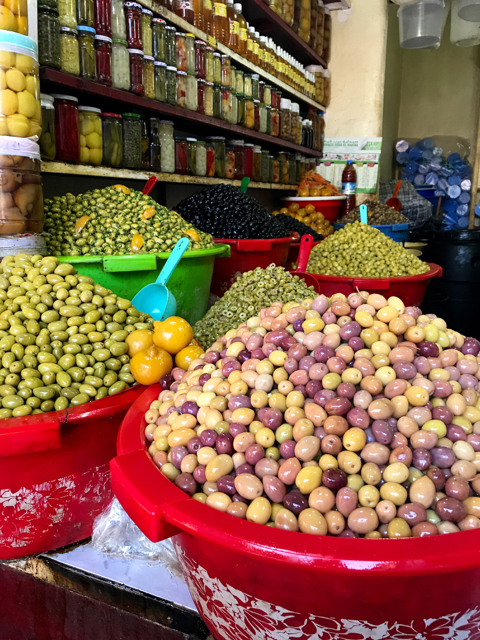 The Moroccan approach to food is everything home grown, freshly picked, bought daily from the Souks or markets & cooked. Fruits, vegetables, eggs, meat, poultry, breads – prepared with an amazing array of herbs and spices. 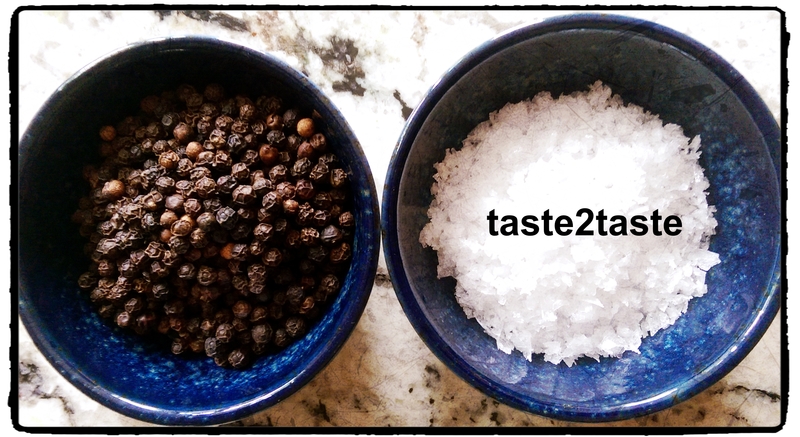 The aromas, layers of flavours & textures are a wonderful assault on your senses in a profound way – I’m a big fan! We ate incredibly well, with four stand out meals in particular. Firstly Saida’s wonderful lunch of meatball & egg tagine and marinated chicken skewers with couscous- you will have to visit to taste for yourself! Secondly, dinner at the Cafe Arabe on the roof terrace, which was as much about the view and atmosphere as the food. 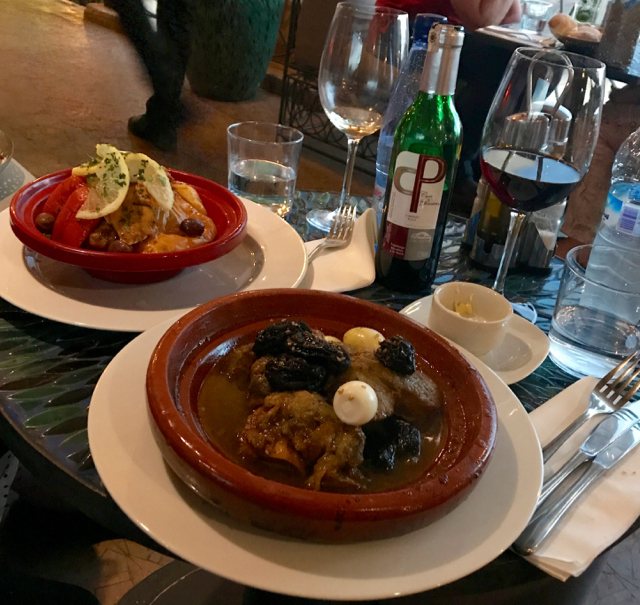 We had a delicious lamb and fish tagine and a glass of red wine being one of the few places that serve alcohol. There was a buzzy, relaxed atmosphere watching the sun set listening to the call to prayer from the muezzin. There were 3 mosques nearby and it sounded slightly competitive as to who could call the loudest, summoning the locals to prayer! The third restaurant, Latitude 31, a short walk from the Riad came highly recommended by Anna & Tony and we were not disappointed. 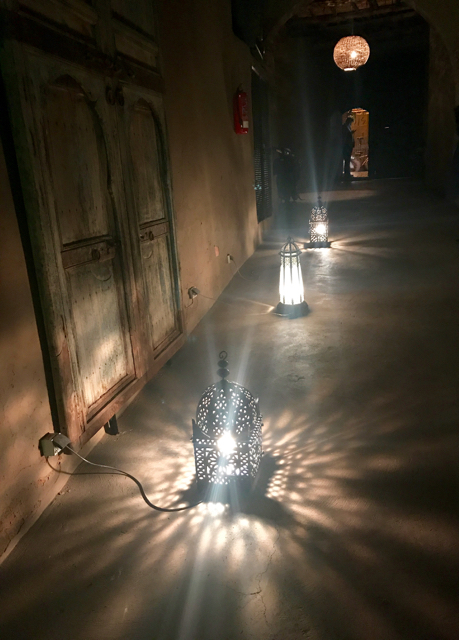 A common theme , entering through a large wooden door, this time through a narrow stone passage following the lantern lights & through a second door which opened out to reveal a beautiful open air courtyard lit by more lanterns – very romantic! We started with some freshly squeezed juice combos as there is no alcohol served. They tasted refreshing and a perfect start to a fantastic meal cooked by Redoin the chef and his team. We were expertly guided through the menu by Yassin, who bought us a trio of amuse bouche of a spinach parcel filled with local cheese, pumpkin crème brûlée & a croustillade (pastry case) filled with tuna whilst we decided what to choose. 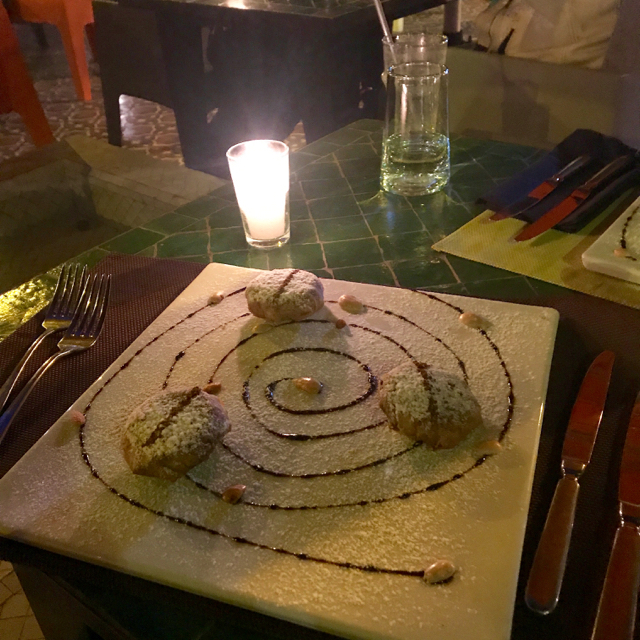 I had the trio of coquette pastillas with almonds, traditional sweet & savoury chicken filled pastries dusted with cinnamon & icing sugar- delish! We had a vegetarian tagine and a speciality of Marrakesh – a Tangia Marrakchia – beef slow cooked (traditionally in an urn shaped terracotta pot) with onions, garlic, cumin, ginger, saffron, preserved lemon, smen (Moroccan preserved butter) and then seasoned with the famous spice mix -Ras el Hanout. The aromas were amazing as the tagine lids revealed the dishes. The tangia with its tantalising flavours- complex yet blending so well- savouriness with a slight sweetness and piquancy from the preserved lemon – fabulous! We opted for the recommended chocolate delight – a solid sphere hiding some velvety ice cream – watch the video for the full experience! 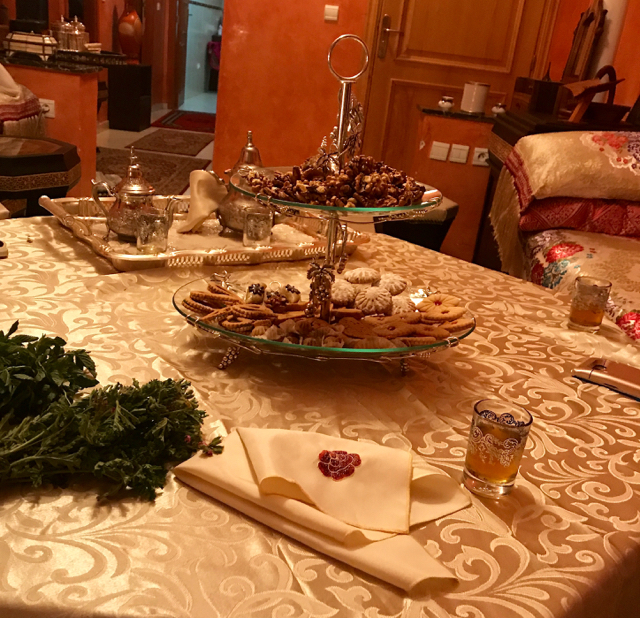 The last meal, and the most special, was at Aziz & his wife Atika’s home – an authentic Moroccan experience. We sat in their sumptuously decorated Moroccan salon, with beautifully carved furniture hand crafted by Atika’s family. 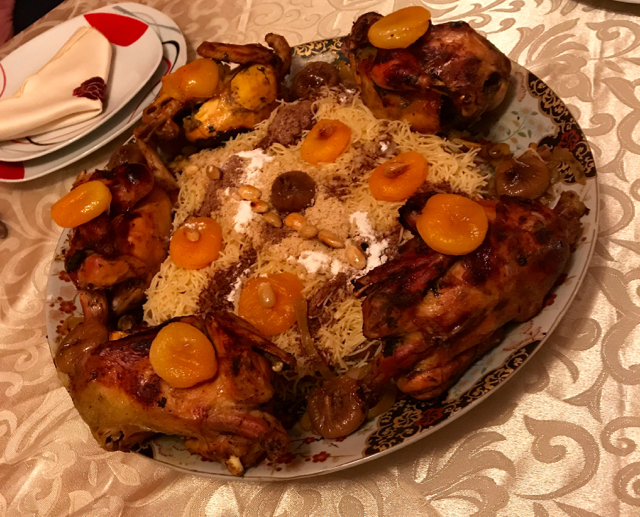 We had a wonderful meal of Seffa – chicken with vermicelli, an onion sauce with almonds, apricots, figs, raisins, decorated with a sprinkling of cinnamon. It is a celebratory dish often eaten at festivals- and a combo of flavourful succulent meat with the vermicelli absorbing all the sweet and savoury flavours that typify Moroccan cuisine – delish! There was lively conversation and an opportunity to practise my basic French. We finished with a herb tea- expertly blended and prepared by Aziz – a refreshing end to a gorgeous meal. 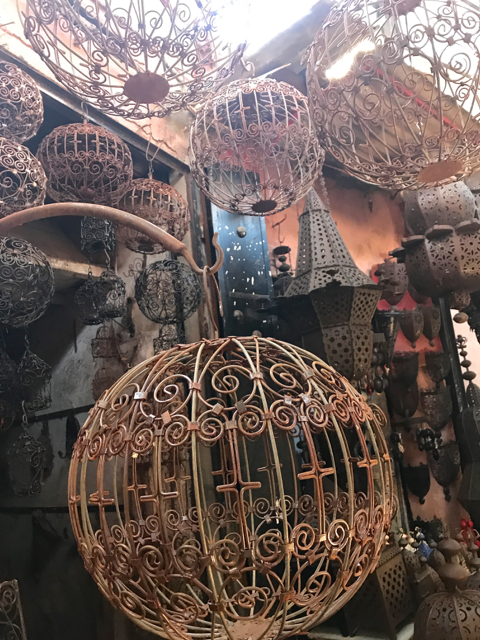 A holiday highlight was a 3.5 hour tour of the souks – with personal guide Mohammed Tabalqait. He came highly recommended by Marian & now by me – do not go elsewhere for a bespoke tour catering to your personal interests- interesting, informative & insightful! 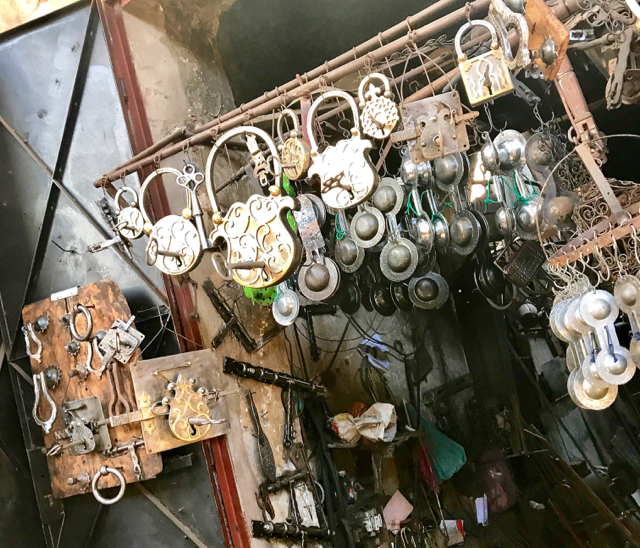 As a foodie , Mohammed expertly guided me round with history, stories, and a heavy focus on food and the other crafts hand made in the different souks. We were offered to eat breakfast with the lock makers – Bissara – a breakfast soup of fava/ broadbeans slowly cooked in a terracotta urn with a sprinkling of cumin, & drizzle of olive oil and eaten with barley bread. I thought Mohammed knew them – but he didn’t. A kind act of humble artisans sharing their food with strangers that was very touching. 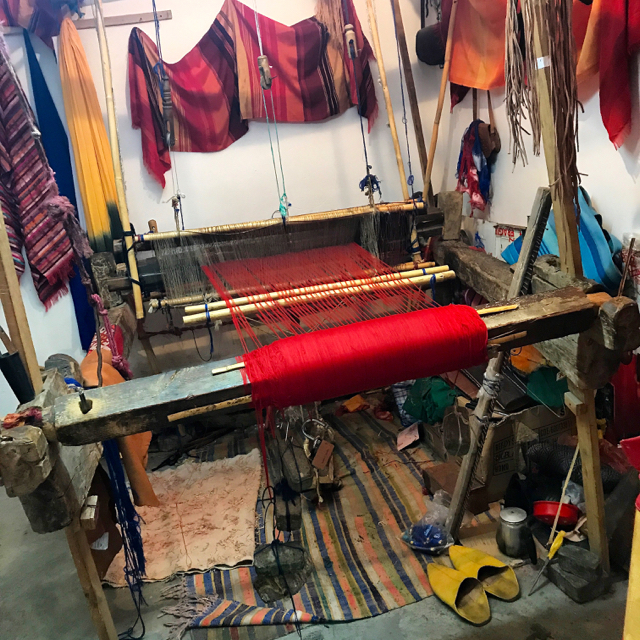 Rather than describe the souk experience I will let the photos do the talking! There are so many memories that have left a lasting impression – especially the people I met – now friends. 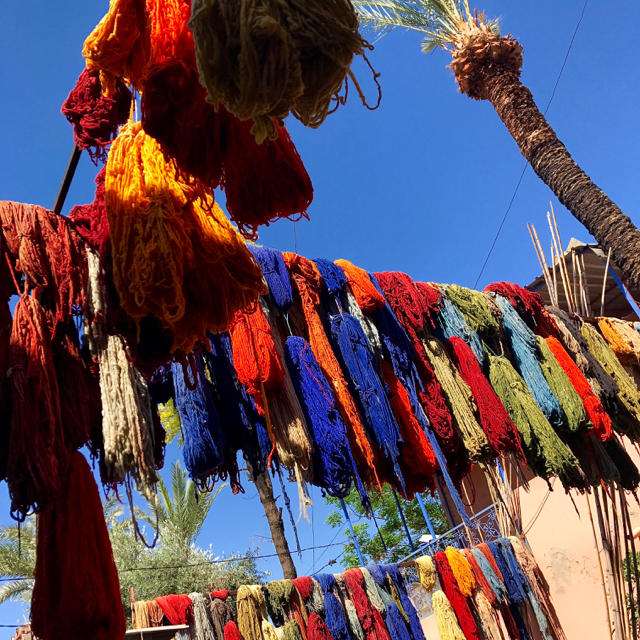 I will definitely be returning to magical Marrakesh hopefully soon. For more info please on the Riad check out http://www.lestroismages.com, Facebook & Trip Advisor. You put into words and brought alive a very similar experience we had there last year. I tried to capture the essence of the place- such a great holiday- glad you enjoyed Marrakesh too! I loved the story of your stay in Marrakech. I have been there many times and always stay at Les Trois Mages so it was lovely to read what you had written about it. Aziz, Saida, Mouhsin and the team are lovely and I am always welcomed like family. Looking forward to my next visit in October.